You probably know someone who has lost some photos/digital images via a computer crash, damaged or lost cell phone, fire or another way. You probably have printed photos and digital images you care very much about keeping safe. You might be the unofficial “Keeper of the Family Heritage Photos”, having inherited all of the precious photos. that media formats do change and what do we do then? I have identified the safest and most long-term backup, storage and format conversion possibilities at this time. I will empower you with this knowledge, so you can decide which is a match for you and dramatically decrease the chances you will ever be surprised or devastated by a loss. Additionally, you know all those precious old videotapes, film reels, audios, etc. from decades gone by? I’ll share the “Concierge of Media Conversion” with you. You’ll be able to convert them to today’s formats and enjoy them forever. I feared I’d never hear my parent’s voices again and, through media conversion, I can and do listen to and watch them whenever I want. I can hardly wait to share all of these possibilities with you! 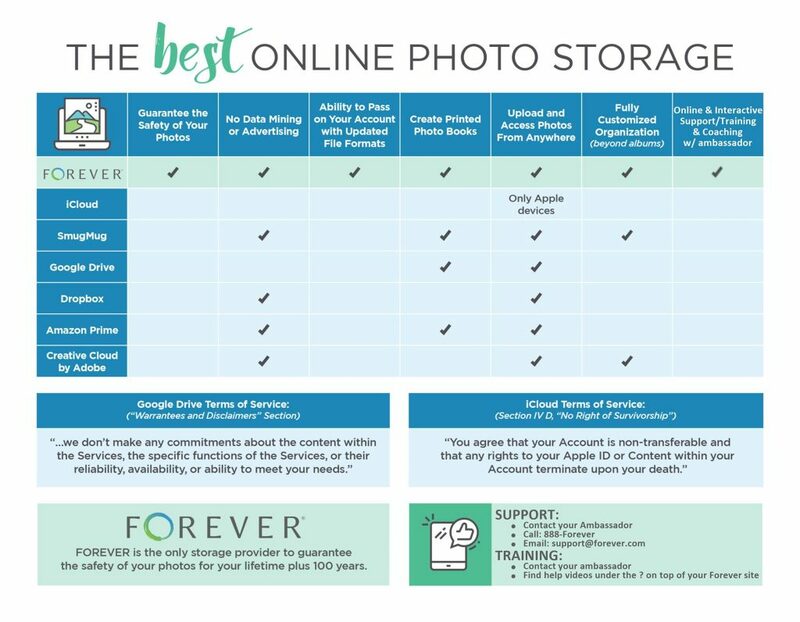 Take a look at this comparison chart to see how Forever stacks up against other companies.